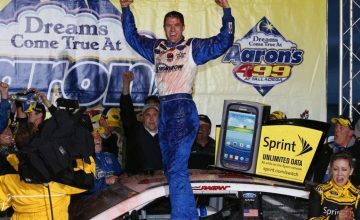 (via NASCAR Wire Service) TALLADEGA, Ala. – The massive wreck in Turn 1 that gobbled up a pack of trucks in overtime at Talladega Superspeedway spared a part-time driver with one win on his career resume and a lower-budget team fighting for the final spot in the Round of 6 of the NASCAR Camping World Truck Series’ Playoff. 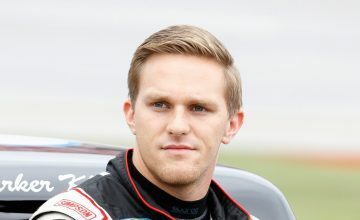 The part-timer, Parker Kligerman, charged to the front past pole winner, series leader and race runner-up Christopher Bell after the final restart and had the lead in Saturday’s Fred’s 250 when trucks started bouncing off each other in Turn 1 on the final lap. That wreck caused a caution that froze the running order and gave Kligerman his first victory since he won at Talladega in 2012. The real suspense, however, involved John Hunter Nemechek, who steered his already-wrecked truck through two major crashes in the final 25 laps to finish sixth. Nemechek grabbed the final spot in the Round of 6 over Chase Briscoe, who finished 22nd, nine laps down after his team dealt with a valve cover issue early in the race. 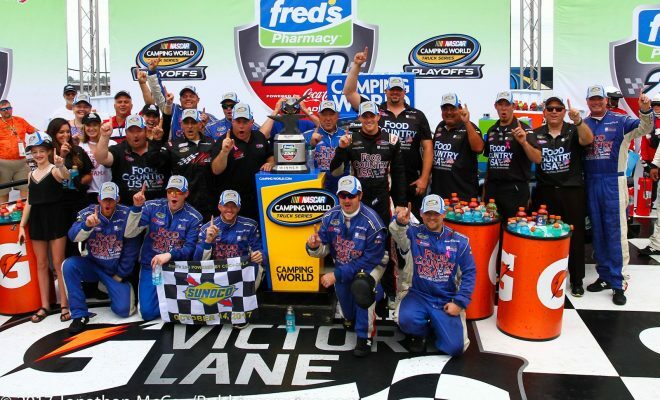 “We had a long team meeting last night in the lobby of our hotel, and we sat down and said a prayer that we would make it to the next round,” Nemechek said. Shortly after the restart of the final stage, it appeared the prayer would not be answered. Nemechek’s No. 8 Chevrolet was damaged heavily in a crash that started when Ben Rhodes turned Clay Greenfield’s Chevrolet in Turn 4 on Lap 54. Nemechek’s team worked feverishly to repair the damage to the extent possible and kept the No. 8 on the lead lap. With Briscoe locked into a 22nd-place finish, Nemechek had to finish 13th or better after Austin Wayne Self’s spin in Turn 4 caused the sixth caution on Lap 90 and sent the event to overtime. When trucks in the lead pack started wrecking in front of Nemechek after the field took the white flag, spotter Jason Jarrett guided his driver through the melee and gained enough spots to advance comfortably. 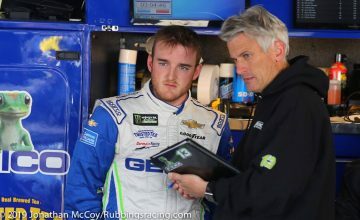 For Kligerman, it was a case of right choices at the right time. For the first 40 laps, Talladega looked like Johnny Sauter’s personal playground. The defending series champion powered into the lead after the start, pulling GMS Racing teammate Justin Haley with him. Sauter and Haley dropped to the inside lane in front of Bell and ran in lock-step for 20 laps, with Sauter winning the first stage wire-to-wire. Sauter may have sailed through Stage 1, but calamity struck two other championship contenders. On Lap 8, Briscoe took his No. 29 Brad Keselowski Racing Ford to the garage to repair a fluid leak and lost 10 laps in the process. Briscoe’s issues, however, couldn’t compare with those of Kaz Grala, who started the race from the rear because of a last-minute engine change. After working his way Grala was the victim of a chain-reaction wreck of Turn 4 on Lap 19, also involving the trucks of Cody Coughlin, Chris Fontaine, Rhodes and Ryan Truex. Grala’s No. 33 Chevy nosed into the outside wall and spun into the infield grass, where the heavily damaged Silverado sat until a wrecker towed it to the garage. Grala retired in 29th place, his Playoff over. “I’m not quite sure what happened,” Grala said after a mandatory visit to the infield care center. “Everything checked up in front of me. I slowed down. I think I was going to miss it, but the truck behind me (Truex’s Toyota) didn’t get slowed down fast enough and turned us up into the wall and ended our day. Notes: Myatt Snider sustained damage in a Lap 70 wreck but rallied to finish a career-best third… Austin Cindric ran fifth behind Grant Enfinger and secured a spot in the Round of 6, joining Bell, Sauter, Nemechek, Rhodes and Matt Crafton. ← Previous Story Handy: Where Does Landon Cassill End Up in 2018?